You can also watch the Viezu Audi TT dyno run here: https://www.youtube.com/watch?v=IddKW5XIcbA&list=UUGss6gdMa2MePHI9H9eYOqw&index=20 Viezu always put our Audi TT customer’s needs first and our tuning can be custom tailored to ensure we meet your requirements. If you want more thrust then our illustrious Audi TT performance remap, is for you. Or if you have fuel economy in mind, then Viezu’s BlueOptimize Audi TT economy tuning is for you. We can also accommodate you if you’d like a blend of the two, thus getting the best of both worlds. 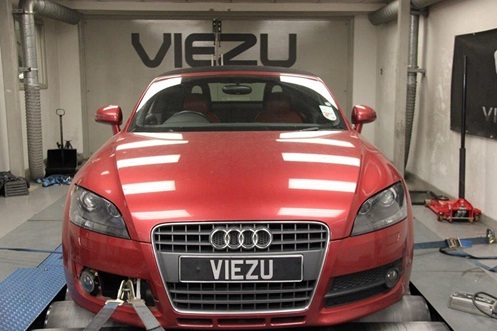 If your Audi TT is a petrol/gasoline engine, and want to augment it, we can also create a custom remap for performance which will account for any additional Audi TT modification you have Viezu have over 400 dealers around the world, and operate in over 42 countries. If you are looking for Audi TT tuning in our store, you can see this here: https://viezu-store.co.uk/product.php?productid=17564&cat=278&page=1, and our Audi TT V-switch home tuning system can be seen here: https://viezu-store.co.uk/product.php?productid=17516&cat=263&page=1.